What is the origin of man? What is the purpose of life? Is there life after death? The Plan of Salvation is the Mormon answer to these life questions and this drawing is a schematic representation of that plan. 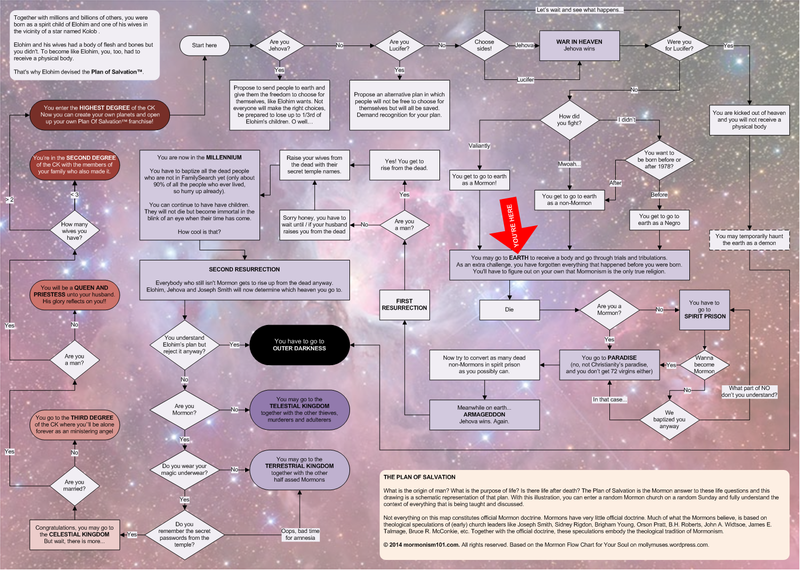 With this illustration, based on the Mormon Flow Chart for Your Soul on the well-written and witty blog mollymuses.wordpress.com, you can enter a random Mormon church on a random Sunday and fully understand the context of everything that is being taught and discussed. Not everything on this map constitutes official Mormon doctrine. Mormons have very little official doctrine to begin with. Much of what the Mormons believe, is based on the theological speculations of (early) church leaders like Joseph Smith, Sidney Rigdon, Brigham Young, Orson Pratt, B.H. Roberts, John A. Widtsoe, James E. Talmage, Bruce R. McConkie, etc. Together with the official doctrine, these speculations embody the theological tradition of Mormonism.